Vacuum Seaming. Vacuum and Nitrogen Flush Seaming machine. Food Canner. Semi-Automatic Vacuum Seaming machine for Hermetic Seaming of Cans in modified Atmosphere. Vacuum, Gas Flushing and Seaming in consecutive operations with the single press of a push button. User Selectable Options for Vacuum Only, Gas Only, Vacuum + Gas and Multiflush. Available with options for Stainless Steel Contact Parts, Tooling, Covers and Cladding. Final Oxygen Levels achievable of less than 2% (product dependant). Ability to seam a wide range of Can Diameters & Heights with a quick changeover of tooling. 4 Roller Can Seaming ensures consistent and leak proof Seams. Suitable for Metal, Composite or Plastic Cans. PLC Based Control Panel and Vacuum Setting gauge for precise control of Vacuum Level and Gas Flush Time. 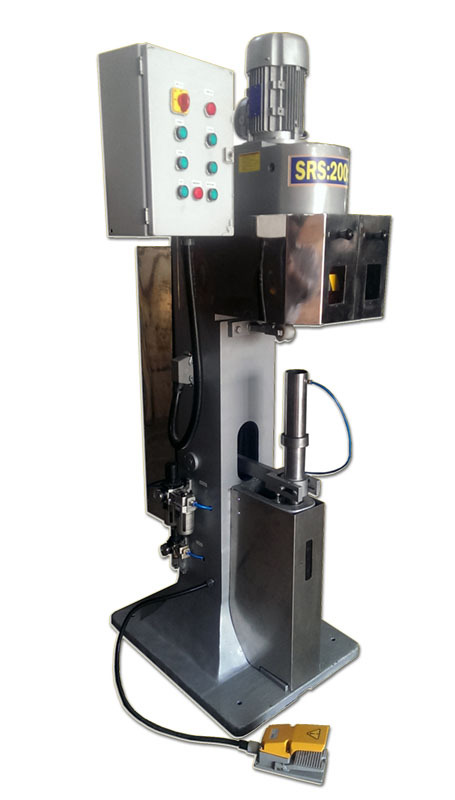 Machine can also be used for pressure seaming of Tennis Ball Cans. The Can with the Lid (End) to be seamed is placed on the lifter plate. A Foot Switch (electronic) or Dual Push Buttons are pressed. The Chamber Closes , the Can is Vacuumized and then flushed with Nitrogen. On completion of Flushing, the Can is Seamed and the Machine is ready for the next Can. All operations take place consecutively without any further operator intervention. The Vacuum and Gas Flush times can be set to user desired levels in the control panel. The machine also has a multi-flush option for multiple Vacuum+Flush cycles, if required. *Machine can be modified to suit customer requirements and applications.